China’s enduring march to expand in the South China Sea is not flexible or fluid. It was set in action 10 years ago and is proceeding as scheduled. 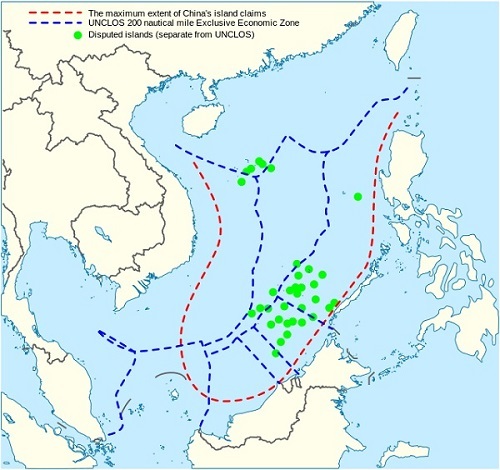 Every objection is met with a rebuff that paints the party objecting as an intruder into sovereign Chinese territory, as defined by the now-famous nine-dash line. Nothing the Philippines can do is likely to stop implementation of the plan. “China moving to ‘retake’ island from the Philippines: report” issued by Want China Times on January 16, 2016. This article presents the stark reality that physically taking Pagasa Island is a probable near-term Chinese move, with justification based on a claim that it is in response to the arrogant land-grabbing being done in the South China Sea by the Philippines. Any complaint by the Philippines forms the basis for acting. Resistance is futile. China moves with the same pressing certainty as a Star Trek Borg collective. Let’s look at Pagasa Island, and also consider the value of the Spratley Islands to the Philippines and other nations. Then we’ll look at what stance the Philippines might take. Pagasa is a municipality of Palawan resting about 250 nautical miles west of Palawan. This is outside the UN-defined 200 nautical mile Exclusive Economic Zone (EEZ) that belongs to the Philippines. The Philippines established Pagasa as a military outpost in 1970 and has since added civilian residents who mainly engage in fishing. The island’s living capacity, at 37 hectares, is about 300 people. Generally, there are fewer than 200 people living on the island, some 40 to 60 of whom are military troops. The island has a rudimentary airstrip. There is debate as to highest and best use of the island, with some seeing it as having military value and others (local residents, for instance) wanting to exploit the tourism potential. China, Taiwan and Vietnam do not recognize the Philippine claim, all stating prior use and historical rights. Why are nations interested in the Spratleys? China wants the resources and the ability to control ships and planes that pass through the territory. Resources means oil, gas and fish. China is the only nation that wants the territory for OFFENSIVE military purposes, that is, to control what other nations can do. Taiwan’s claim duplicates that of Big China, without the offensive military intentions. Vietnam wants the resources and to establish a defensive perimeter. The Philippines wants the resources and to establish a defensive perimeter. What volume of oil and gas are we talking about? That’s a rather interesting point, and the debate boils down to some finite realities, are we willing to die for these resources? First of all, not much has been PROVED in the area. The only proven resources are near established land masses clearly within national economic boundaries. 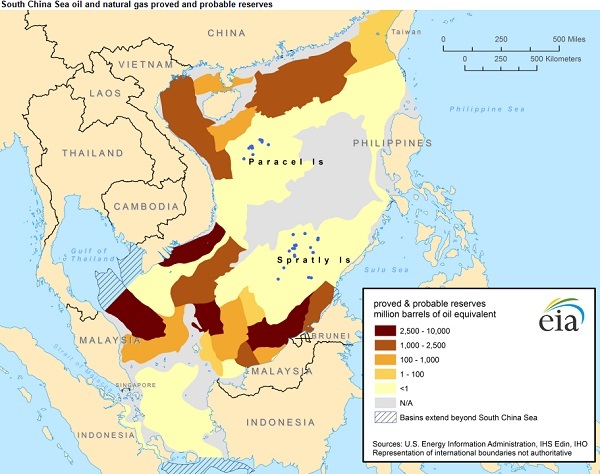 Here’s a map issued by the U.S. Energy Information Administration in April of 2013 in a report entitled “Contested areas of South China Sea likely have few conventional oil and gas resources“. Well, I think Tomas Cloma was a brave adventurer, but I think his claim has no greater strength than China or Viet Nam’s historical claims. They can show use of the islands going back centuries. I also think the Philippine effort to populate the island was little different than what China is doing by putting boats, people and military encampments on this rock or that. Then scraping up a little sand and calling it an island. But Reed Bank is different. Reed bank is within the Philippine EEZ. All economic benefits should fall to the Philippines. With utmost regret to the people on Pagasa, who are real people, and I am but a scribe playing with ideas, I would swap Pagasa to the Chinese on condition they left the Philippine EEZ. Well, the safety of this offer is based on the simple matter that China won’t trade. As much as the Chinese blather on about bilateral agreements as if such discussions would benefit both parties, the established Chinese plan does not consider reason to be relevant. Only expansion and acquisition are relevant. So for the Philippines, as in a case of chess, the pawns need to be defended. Philippine sovereign well-being rides on that defense. It is a matter of what is right, it is not about oil or natural gas. A nation like China that claims it wants bilateral talks but pursues unilateral acquisitions without any discussions is as wrong as wrong can be. And so Pagasa needs to be defended. Even if the Cloma claim is weak. Even if there is no oil or natural gas. Odds are, there is a storm brewing. You ready? Let me give you one little observation as I drop this off for publication. Undermining a sitting president does not strengthen the Philippines. It seems to me that Filipinos are in some trivial world of singing and dancing and debates about artists’ awards, or political protests that undermine. Far from ready. Far from focused. Far from committed to the Philippines. No truer words said. Indeed, the Supreme Court could have decided on the fate of the Sandiganbayan Justice Gregory Ong before declaring the DAP unconstitutional. Giving out this kind of ruling in the midst of the plunder charges is like giving the accused senators more ammunition to hit the President and his Cabinet. Too many “causes/issues” that add confusion to a messy plunder charge. As well as GMA’s cases, etc. Please, the Filipino people should all unite behind our President Aquino who is doing his damned best to rid corruption and put a little semblance of honesty in government. Spend the government revenue FOR the welfare of the people, to improve the military equipment, etc. It’s only under his watch that all these corrupt practices are brought into the light and now, we have an ex-National Treasurer saying he can be impeached, etc., etc. Please…. let’s all help to re-build our country, not destroy the great leaders that come upon us. A very important plea. I was reflecting a moment ago that the US is becoming like a Banana Republic, composed of extremist elements that can’t stand any way other than their own, and undermine the entire US to make a point. The Philippines has a chance to emerge from a coup-minded, divisive, my-way-or-else approach . . . has the chance to be something other than a Banana Republic. But I don’t see that unity of purpose emerging, the willingness to sacrifice individually for national strength, that would define the nation as being something other than a Banana Republic. Touche, Joe! (And also a nod of agreement on Chit Navarro’s point well-taken). I moderately revel that singer expatriates on Youtube, Philippine folk songs and dances getting a lot of mileage, and the adulation surrounding Lea Salonga, Manny Pacquiao and also Charice Pempengco all do contribute to an international visibility for the Philippines and Filipinos. We are justifiably behind our artists and sports personalities. Now, with affairs of state and diplomacy we as a people are not perceived in a unity that should normally picture our people as a bonafide citizen of the world because of what Fallows calls internecine squabbling among our senior officials, media and citizens. There is definitely something wrong with the picture. The picture is atilt, for sure. Actually, I am personally impressed with Filipino talent and showmanship. But that does not make a nation. A nation is made of values and goals that are good, and deeds that take care of the people, and to be dancing and arguing whilst a big beast is breathing heavily on Philippine territory seems a bit like fiddling in Rome to me. As a concern citizen … We don’t need war… We must respect and the is the virtue where China don’t have. .. We must learned from our fast and as a brother pls. must each other…History repeat him self and in this case we must upward in higher level. Is the report on oil still accurate? We are drilling to the west of Palawan already. Anyway, I really dislike the fact that few Filipinos care about the Spratly Islands. Have we lost our pride? Oh wait, it is easy for us to get angry when a foreigner bashes Megan Young and get much less reaction when the chinese thieves took Scarborough. We have pride but it is misplaced. Vietnamese on the other hand burned the chinese thieves factories and mobilized their ship. Changing the mentality will take a lot of work and time and by that time it is too late. I am already thinking of migrating to another country before I do something stupid. This country is hopeless. It is accurate, I think. But the caveat is found in the words “few proven or probable”. It takes drilling to find out. When I originally set out to write the blog, I was taking an “it’s not worth fighting to the death” over. Let China spend money chasing the oil and let’s focus on thermal, wind, solar, waves and hydro. My island of Biliran could be a huge energy exporter, but for a host of reasons, it doesn’t happen. Game-playing by government is one of the reasons. I appreciate your frustration, for sure. I would not count on china leaving the eez in exchage for pag asa as seen with what happened scarborough which was supposed to be a mutual withdrawal. That’s interesting, Janice, I had thought of China’s thuggish behavior having the purpose to control the air and seas, and the nations using them, but it may also be to subject outer nations to China’s will. For whatever future purpose. I rather think it won’t work and China’s grand plan is exceedingly stupid. If you notice, countries that disagrees with the “China logic” irritates the hell out of them. If the CCP is a lot more powerful, they’d be invading any nation that disagrees with their policies. Yes. The national attitude is one I closely link to racist, one that believes other nations are made up of lesser beings. The Filipinos are so individualistic who only think of their self interest, of number 1. For the sake of the future generations, there is an utmost need to unearth the underlying causes to such mindsets, then initiate upheavals of changes in socio – cultural ways of life, education and economic perspectives. Easier said than done. The desired unification among the people is a far fetched dream. The divide and conquer policy has been the political game of the politicians for vested – interest since the Spanish time up to now, that it has so entrenched into the innermost of the people. Btw, I’ve been on a pilgrimage to Our Lady of Lourdes, France, Our Lady of Fatima, Portugal, and Our Lady of Carmel in Garabandal, Spain and St James Basilica in Santiago Compostela, Spain. I prayed for you Joe and your family. Ahh, what a wonderful pilgrimage, and I am very touched by your kindness. I’ve been to Santiago Compostela, Spain, and it is one of my most favorite cities in the world, a place with soul where it is delightful to wander the narrow streets of the old city; it has a huge cathedral reflecting Moorish and Christian designs, also rich with spirit. I wrote a poem entitled “The Ghosts of Santiago”. I’ll have to see if it is lodged somewhere in a nook or cranny hereabouts. I also agree with your first paragraph, that it would be good for Filipinos to reflect about the “I” mentality, why it is there, whether it is good or bad, and how to direct interpersonal dealings to do more good. It is important not to just recognize the behavior, but get beneath it to figure out why. I’ve read the comments and wondered what could be the focus of this article? Is it about the character of the Filipino people, or, is it about China’s plan to invade Philippine territory as inferred by the title? I’m confused. It’s about both, as they are related. The article was background to a position, that position being that China is serious, Pagasa should be defended, so get ready. Some responses are that, indeed, there is little apparent readiness, or there is apathy.